(rollover to compare with normal) What Is It? 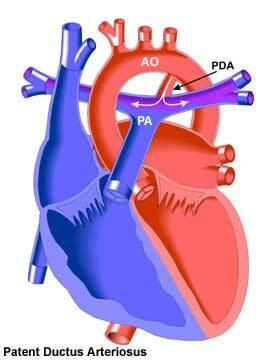 A Ductus Arteriosus is a fetal vessel necessary to support the fetal circulation while in utero. This vessel sometimes persists after the newborn period into childhood. In the fetus, ductus arteriosus connects the aorta to the pulmonary artery (PA in diagram). It is termed a Patent Ductus Arteriosus (PDA) when it is open later than the newborn period, allowing blood to flow from the aorta into the pulmonary artery. After the PDA closes, the resulting fiber-like structure is known as a ligamentum arteriosum.